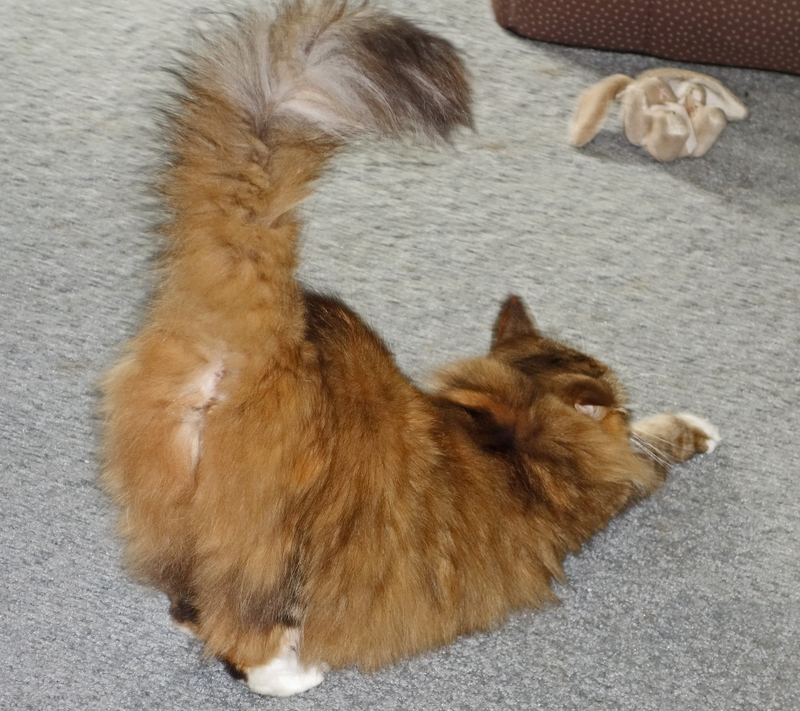 Over the next few weeks, my Friday Sassy Cats will feature one of my feline friends and their stories. Hope you enjoy. 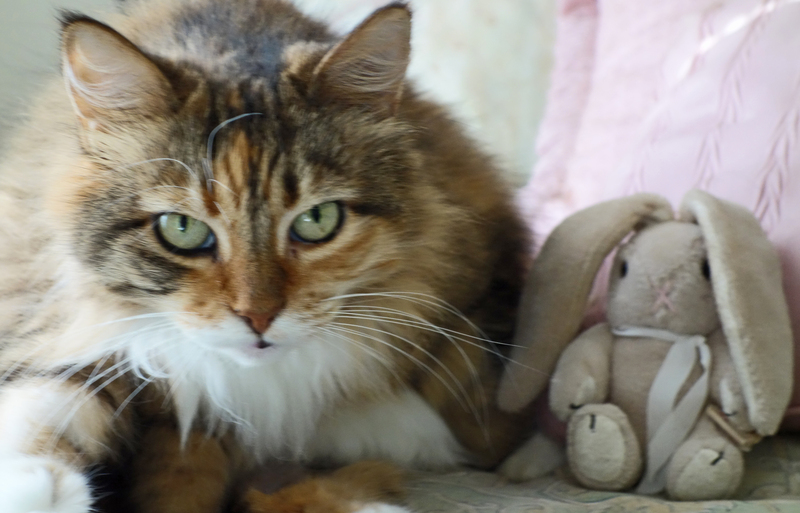 Mollie was adopted as an adult mother cat who already had a litter of kittens. All the kittens were adopted but no one wanted the mom cat. I don’t know why. She is gorgeous and so small at under 7 pounds that she looked like a kitten herself. When I met her at the shelter she was extremely shy. When I took her into the “meet and greet” room she high tailed it for the waste can and hid. That’s the best I got before I took her home. Even at home, she took to our resident cat Jake before she took to me. Jake loved her. He is picky with his friends both human and feline so I was very pleased. She got sick. They didn’t want to release her but I could take better care of her than they could. We headed to my vet who said she was good except for respiratory issues. She got some meds but promptly gave the respiratory illness to Jake who also had to take pills. He wasn’t happy about that but blamed me, who administered the pills, rather than his new buddy Mollie. Unfortunately they both took a turn for the worse and spent a week in the vet hospital so there was no cat in the house. It was a very sad quiet week. A week before her scheduled surgery she went into heat. Holy cow! She caterwauled all night. Jake flapped his ears down to block out the noise. She paraded her lady parts in front of him. He put his paws over his eyes. (Yes he did that. I think he was scared!) She pulled out all the hoochie coochie tactics but he wasn’t having any of it. The next day I moved up the appointment. She’s a very graceful lady cat. Here are some comments I’ve heard her say. At age 14 she is still a tiny lady cat who wears white gloves and stockings although she’s no longer looking for sailor boy cats. As the smallest at 7 pounds she’s also the alpha cat and rules the roost. 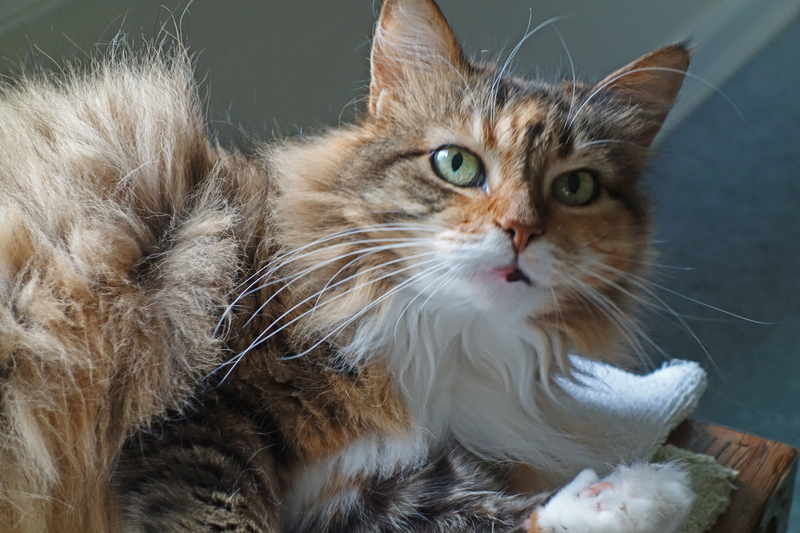 This entry was posted in Cat Adoption, For Animal Lovers Only, Humor, Sassy cats and tagged adult cats for adoption, animals, cat adoption, feline companions, harder to adopt animals, Mollie, pets, shelters by Kate Crimmins. Bookmark the permalink. She’s a sweet heart and after I brought her home, she didn’t hide in trash cans. She hid behind the old computer tower. Being hard to get really makes sure you’ve got them well snared and the home secured? Prior to this crew, my cats were indoor/outdoor. We even had a cat door to let Jake go outside and come in. None of these cats ever tried it ever as they watched him go in and out. I was flabbergasted. We locked the cat door after Jake passed (and we found out the raccoons were having parties in the porch at night). Even if the door is propped open a few seconds to get something out, no one has interest in investigating the outside. All 4 of them were outdoor cats originally so I am truly flummoxed. I take it to mean they realize how good they have it. BTW I’d never have an indoor/outdoor cat again. Too much worry. I was about to get a GPS animal tracker for Jake as he was getting too old to defend himself but he took a turn for the worse and passed. She’s looking for a modeling career! She really should be on the cover of Vogue Magazine … or the cat equivalent! Mollie is beautiful. I can just imagine how it feels to pick her up. I’m not really surprised that she rules the roost. One of the nice things about cats is how they surprise us with their personalities. She’s like a feather especially compared to Hazel. She is a benevolent dictator. I enjoyed getting to know Mollie better. What a sweet kitty. Wonderful that she and Jake were pals. I had lost Lacey, an all black female that did not get along with Jake. She was quite old (about 18) and I kept her in a large sunny bedroom where she was safe. She really was the instigator most of the time but their bad blood started when he was young and she wasn’t happy with him. It was a relief that Jake took to Mollie right away. No hissing at all. I love your cat stories. We adopted three adult cats, and they NEVER got along. I hope that doesn’t mean we were bad parents. They are like people. Sometimes they just don’t like someone. The cat before Mollie did not get along with Jake so I was relieved that they liked each other. We adopted Hazel a few months later and he liked her too. That’s marvelous to have a peaceful cat household. Yes. I had 6 years of refereeing between Jake and Lacey so I’m very grateful. Wow, 7 pounds IS petite! She sounds like quite the lady cat. Her last kitten was bigger than she was. He was already adopted but hadn’t been picked up yet. Oh, Queen Mollie, you are a pretty girl! Hahaha, That bit about Jake covering his eyes is a HOOT. Poor boy. He didn’t know what had come over her! I keep meaning to do my cats’ stories and still haven’t gotten around to it. LOVE THIS. Thanks. These are fun to do. Mollie’s a beauty! I enjoyed her story, I love that she was adopted as an adult. All my cats were adopted as adults and it worked out well. It’s always a risk. Jake did not like Morgan. When we adopted Morgan he was already 15 or so and he didn’t want to deal with a younger upstart. Morgan was (and still is) an active cat but she soon learned that Jake didn’t do “play.” I was grateful that they just ignored each other rather than fight. Glad Mollie is ruling the roost with style! What a wonderful feature, Kate. I loved learning more about Mollie. I look forward t reading more about Hazel, Morgan and Gracie as well! Each one is very different. Hopefully they won’t get boring. Bat Cat had one heat before I had her spayed — mainly because she was so small as a rescue small I had no idea how old she was. Luckily, she had the neutered Shamu Cat to wash her face and calm her. He had no interest, but he was kind. It was still horrible. Spaying commenced immediately! When I was a child, our cats were indoor/outdoor so any “heat” happened outside where the male cats were. Inside it was loud and it went on for most of the night. Poor Jake. He was neutered young so he had no idea what was goin on. Thanks for sharing Mollie’s story, Kate. You were meant to be her mom! She is pretty special (but don’t tell the other cats!). I am so impressed with Queen Mollie and she is indeed beautiful. Her life story is worth telling too and how fortunate you both are to have found each other. Yes. The adoption worked. She was and is happy here and except for her dental issues and some allergies, she’s very healthy. I told her it’s coming! She’s very excited. Thanks! Mollie really is gorgeous. I adopted a juvenile once for the same reason (everyone wants kittens). Although she never became fully trusting of others (I didn’t know her background but I’m sure it wasn’t great, poor thing), she was a love to me. Hazel is like that. She was around a year old and part of an outdoor litter. Not much socialization as a kitten and she has never warmed up to people. She allows me to brush her and stroke her most of the time but sometimes she will hide from me too. As she is getting older she is getting more mellow or it’s too much trouble to run. Way to go Queen Mollie! I’m so sorry and so is Mollie. She has allergies too but it’s not people. Mollie is beautiful. Thanks for sharing. Thanks for stopping by. Mollie thanks you for recognizing her beauty! Mollie is beautiful, sweet and no trouble. I don’t know why someone surrendered her to the shelter with her litter. I don’t know why someone didn’t get her spayed and keep her but their loss is my gain! Mollie is a beautiful cat. I am surprised she is the alpha. I don’t know that I would have picked another of your cats as alpha but the fact that she is the alpha cat does surprise me. Scary that she and Jake had to spend such a long time in the hospital with respiratory issues. I am so glad you adopted her! Great pictures for the Sassy Cat post today, and I like the feline friends feature. Looking forward to next Friday! I was surprised about the alpha too. When I brought her home, I kept her isolated for a few days before I introduced Jake. He weighed 10 pounds more and had a history of not liking all cats. She was in a room with French door that had windows so he watched her like a hawk. When I initially opened the door so they could meet, she sashayed right up to him and rubbed against him. From then on they were buddies and if she wanted a chair he was on, he gave it up. Morgan is the only other cat that may challenge her for alpha status but her disposition is pretty laid back. Jake did not like Morgan so she stayed away from him. Cat personalities are interesting. Still miss that old guy. I know. They touch our hearts forever. None of my rescues were kittens. They were all at least a year old or more. They estimated that Mollie was about 18 months old. She has never gained weight so she was full grown. Kittens are so fun but they grow up fast. That adorable stage is very short although for some people the bonding is important. She thanks you as one of her subjects of the realm. She is very welcome. 🙂 I feel like I should bow down. 🙂 OK I am sending a cyber curtsy to her. She has a lot of floof. Fortunately she’s not prone to mats but we have regular brushing sessions.